Can Stem Cell Therapies Help ALS Patients? A scientist’s fifteen-year journey to develop a stem cell-based therapy that could one day help ALS patients. The sentence appeared slowly on a computer screen, each character separated by a pause while its author searched for the next character using a device controlled by his eye muscle. The person asking the question was Jeff Kaufman, a Wisconsin man in his 40s completely paralyzed by amyotrophic lateral sclerosis (ALS). On the receiving end was Clive Svendsen, PhD, then a scientist at the University of Wisconsin-Madison, determined to understand how stem cells could help patients like Jeff. Also known as Lou Gehrig’s disease, ALS is a rapid, aggressive neurodegenerative disease with a two to four-year life expectancy. ALS destroys the nerve cells that send signals from the brain and spinal cord to the muscles that control movement. Denervation, or loss of nerves, causes muscle weakness and atrophy, leaving patients unable to control their own bodies. Currently there are two FDA-approved ALS drugs in the US – riluzole and a new drug called edaravone (Radicava). However, they only slow disease progression in some ALS patients by a few months and there are no effective treatments that stop or cure the disease. Given this poor prognosis, making ALS the focus of his research career was an easy decision. However, developing a therapeutic strategy was challenging to Svendsen. “The problem with ALS is we don’t know the cause,” he said. “Around 10% of ALS cases are genetic, and we know some of the genes involved, but 90% of cases are sporadic.” He explained that this black box makes it difficult for scientists to know where to start when trying to develop treatments for sporadic ALS cases that have no drug targets. Svendsen, who moved to Cedars-Sinai in Los Angeles to head the Cedars-Sinai Board of Governors Regenerative Medicine Institute in 2010, has worked on ALS for the past 15 years. Before that, he studied Parkinson’s disease, a long-term neurodegenerative disorder that affects movement, balance and speech. Unlike ALS, Parkinson’s patients have a longer life expectancy and more treatment options that alleviate symptoms of the disease, making their quality of life far better than ALS patients. The transition from Parkinson’s to ALS was not without a scientific reason however. Svendsen was studying how an important growth factor in the brain called Glial Cell Line-Derived Neurotrophic Factor or GDNF could be used to protect dopamine neurons in order to treat Parkinson’s patients. However other research suggested that GDNF was even more effective at protecting motor neurons, the nerve cells destroyed by ALS. 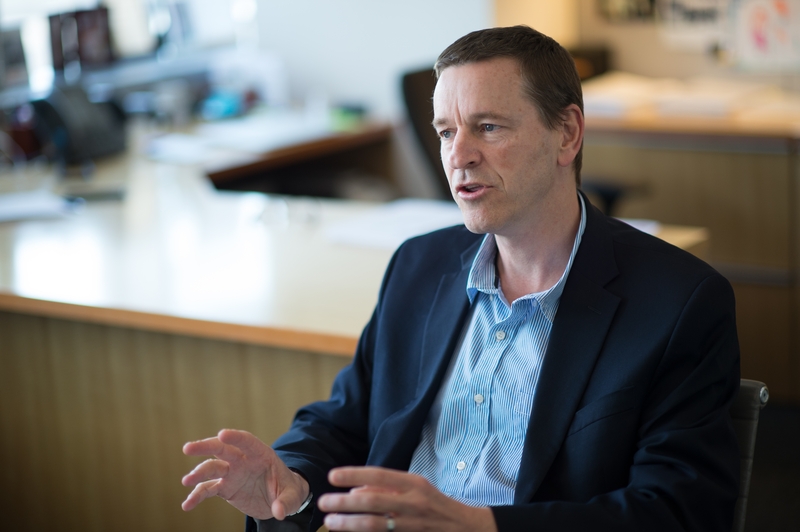 Armed with the knowledge of GDNF’s ability to protect motor neurons, Svendsen and his team developed an experimental stem cell-based therapy that they hoped would treat patients with the sporadic form of ALS. Instead of using stem cells to replace the motor neurons lost to ALS, Svendsen placed his bets on making another cell type in the brain, the astrocyte. Astrocytes are the underdog cells of the brain, often overshadowed by neurons that send and receive information from the central nervous system to our bodies. Astrocytes have many important roles, one of the most critical being to support the functions of neurons. In ALS, astrocytes are also affected but in a different way than motor neurons. Instead of dying, ALS astrocytes become dysfunctional and thereby create a toxic environment inhospitable to the motors neurons they are supposed to assist. 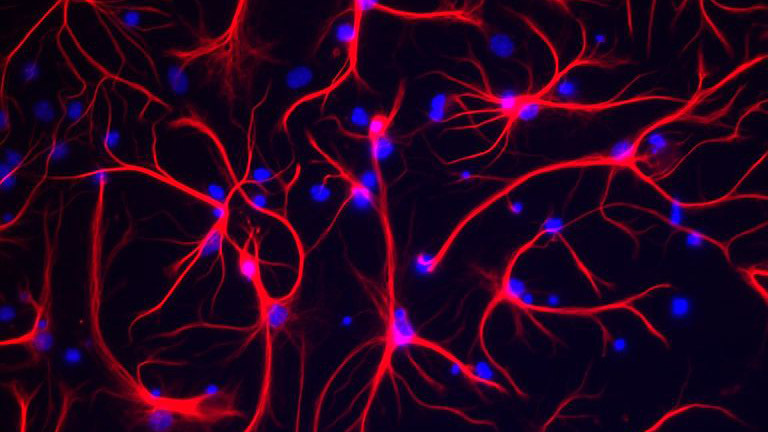 Fluorescent microscopy of astrocytes (red) and cell nuclei (blue). Image: Wikipedia. The big idea was to combine both GDNF and astrocyte replacement. Svendsen set out to make healthy astrocytes from human brain stem cells that also produce therapeutic doses of GDNF and transplant these cells into the ALS patient spinal cord. Simply giving patients GDNF via pill wouldn’t work because the growth factor is unable to enter the brain or spinal cord tissue where it is needed. The hope, instead, was that the astrocytes would secrete the protective factor that would keep the patients’ motor neurons healthy and alive. 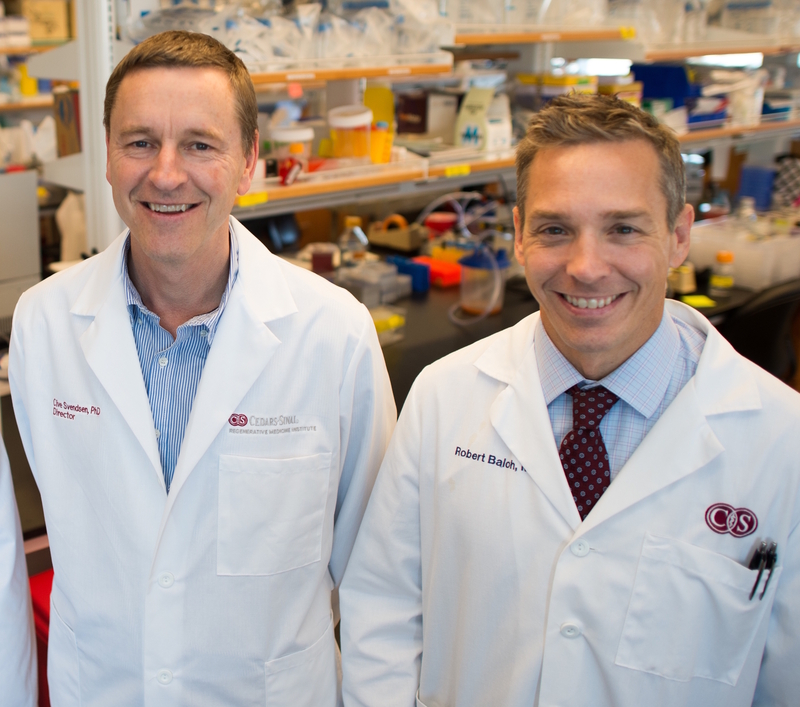 With critical funding from a CIRM Disease Team grant, Svendsen and his colleagues at Cedars-Sinai tested the feasibility of transplanting human brain stem cells (also referred to as neural progenitor cells) that secreted GDNF into a rat model of ALS. Their results were encouraging – the neural progenitor cells successfully developed into astrocytes and secreted GDNF, which collectively protected the rat motor neurons. With promising preclinical data under his belt, Svendsen and his colleagues, including Robert Baloh, MD, PhD, director of neuromuscular medicine at the Cedars-Sinai Department of Neurology, and neurosurgeon J. Patrick Johnson, MD, designed a clinical trial that would test this experimental therapy in ALS patients. In October 2016, CIRM approved funding for a Phase I/IIa clinical trial assessing the safety of this novel human neural progenitor cell and gene therapy. This is a first-in-human study, and as such, the U.S. Food and Drug Administration (FDA) required the team to transplant the cells into only one side of the lumbar spinal cord, which effectively means that only one of the patient’s legs will get the treatment. This will allow for a comparison of the function and progression of ALS in the leg on the treated side of the spinal cord compared with the leg on the untreated side. The trial was approved to treat a total of 18 patients and started in May 2017. Svendsen, who first started working on ALS back in 2002, describes his path to the clinic as a “very long and windy road.” He emphasized that this journey wouldn’t be possible without the hard work of his team, Cedars-Sinai and financial support from CIRM. This “behind-the-scenes” view of how much time and effort it takes to translate a stem cell therapy from basic research into the clinic isn’t something that the public is often exposed to or aware of. Just as “Rome wasn’t built in a day,” Svendsen stressed that good quality stem cell trials take time, and that it’s important for people know how complicated these trials are. Svendsen revisited his story about Jeff Kaufman, a man he befriended at the Wisconsin ALS Chapter in 2003. Jeff had three daughters and a son, a wonderful wife, and was a successful lawyer when he was diagnosed with ALS. It’s people like Jeff that make Svendsen get out of bed every morning and doggedly pursue a treatment for ALS. Sadly, Jeff passed away due to complications from ALS in 2010. Svendsen says what Jeff and other patients go through is tragic and unfair. It’s clear from speaking with Svendsen, that he is optimistic about the future of stem cell-based therapies for ALS. Scientists still need to unravel the actual causes of ALS. But the experimental stem cell treatments currently in development, including Svendsen’s, will hopefully prove effective at delaying disease progression and give ALS patients more quality years to live. Svendsen’s advice for ALS patients interested in enrolling in a stem cell trial or trying a new stem cell treatment is to be cautious. If a therapy sounds too good to be true, it probably is, and if it costs a lot of money, it probably isn’t legitimate, he explained. He also wants patients to understand the reality of the current state of ALS stem cell trials. The approved stem cell trials he is aware of are not at the treatment stage yet. “If you’re enrolled in a stem cell trial that is funded and reputable, then they will tell you honestly that it’s not a treatment. There is currently no approved treatment using stem cells for ALS,” Svendsen said. This might seem like discouraging news to patients who don’t have time to wait for these trials to develop into treatments, but Svendsen pointed out that the when he started his research 15 years ago, the field of stem cell research was still in its infancy. A lot has been accomplished in the past decade-and-a-half and with talented scientists dedicated to ALS research like Svendsen, the next 15 years will likely offer new insights into ALS and hopefully stem cell-based treatments for a devastating disease that has no cure. Svendsen hopes that one day, when someone like Jeff Kaufman asks him “Can stem cells help me Clive?” He’ll be able to say, yes they can, yes they can. Thank you to Clive Svendsen, Ph.D. and Robert Baloh, M.D., Ph.D., plus CIRM and other funding agencies for their commitment to the patients with ALS [Amyotrophic Lateral Sclerosis]. Have Drs. Svendsen and Baloh, or their colleagues, defined the Case Descriptive criteria for the different forms of ALS? Also, have the etiologic complexities of each type or subtype of ALS been identified and described? Please provide reference citations to relevant human research that provides study data on the classification of the types or subtypes of ALS, and pertinent citations to biochemical or laboratory medicine data/preclinical studies of the abnormal molecular mechanisms associated with ALS, as well as the known genetic mutations and epigenetic mechanisms that are involved in ALS; including any case specific descriptions of the ALS type or subtype abnormalities (pathophysiologic mechanisms) that have been elucidated – such as contributory autoimmune processes, focal inflammation, accumulation of and/or decrements in the clearance of abnormal or ‘misfolded’ proteins, and excessive glycation of specific membrane proteins and/or signaling peptides/proteins. Thank you; I will be grateful to receive your response and citations. All the best! Thank you Dr Svendsen I read your article on ALS stem research because I just found out that my brother was diognost with ALS and was hoping you might be able to help him but I know now it’s just a matter of time now but please keep working so maybe no one else’s family has to feel the pain mine has to feel. God Bless you !! Is it possible, and is there data to support, that stem cell therapies might be more effective with ALS variants such as brachial amyotrophic diplegia (BAD), since those variants manifest themselves in a more limited way than ALS?